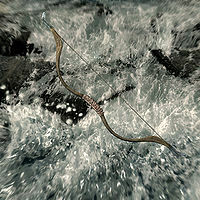 The Bow of the Hunt is a hunting bow found on an altar, next to a copy of the Archery skill book Vernaccus and Bourlor, inside Clearspring Cave. This bow has a unique enchantment that does an additional twenty points of animal damage. Tempering the Bow of the Hunt requires one steel ingot as well as the Arcane Blacksmith perk, with the benefits of tempering being doubled if the Steel Smithing perk is also unlocked. This page was last modified on 29 November 2018, at 16:33.